Major Wall Street banks shut their doors Monday and said they'd waive certain fees, as Hurricane Sandy barrels toward the East Coast. Citigroup (C) shuttered all of its branches in Manhattan and said only a handful of branches in New York, Boston, Philadelphia, Connecticut and Delaware would remain operational Monday. The bank's branches in Maryland, Virginia, and the District of Columbia were all open for business Monday. JPMorgan Chase (JPM) planned to keep 400 of its 1100 branches in the New York tri-state area open until noon Monday and said it will close all branches Tuesday.The bank said it would waive overdraft fees for deposit accounts and late fees for credit cards, auto and consumer loans, business and student loans. Citigroup said it's prepared to waive fees for customers affected by the storm but did not specify which ones. Citi said customers should call the bank to discuss fee waivers. Bank of America (BAC) said it would employ a "no questions asked policy" with regard to fees for customers in areas affected by the storm, according to a spokesperson. Bank of America closed branches along the East Coast from Northern Virginia to upstate New York and through Massachusetts. The bank is currently working to determine whether it will close branches tomorrow and will have a decision shortly. The bank's corporate offices in lower Manhattan are closed Monday but branches in other parts of Manhattan remain open to essential personnel. 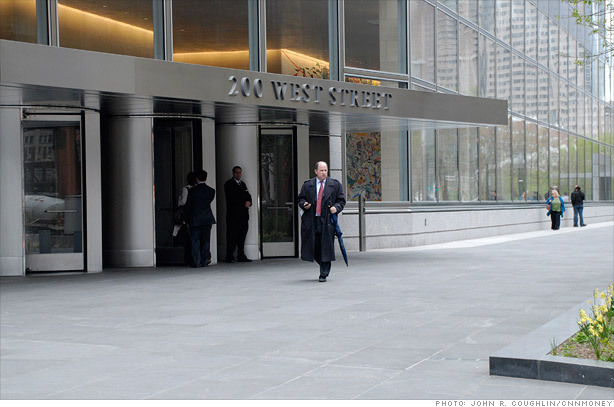 Goldman Sachs (GS) said late Sunday that it would be open for business, though most of its New York employees will work from home Monday due to the bank's proximity to the evacuation zone and transit suspensions. Both Citigroup and JPMorgan expect ATM machines to function normally as long power remains on. A JPMorgan Chase spokesperson said the bank spent last week preparing to have enough cash on hand to serve customers in affected areas.